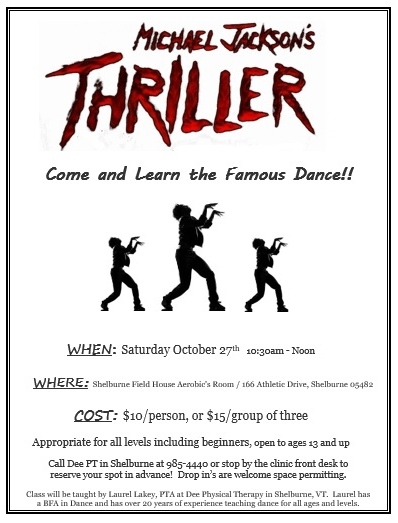 Come and Learn the Famous Dance From Michael Jackson’s THRILLER!! Call Dee PT in Shelburne at 985-4440 or stop by the clinic front desk to reserve your spot in advance! Drop in’s are welcome space permitting. Class will be taught by Laurel Lakey, PTA at Dee Physical Therapy in Shelburne, VT.
Laurel has a BFA in Dance and has over 20 years of experience teaching dance for all ages and levels.